In the Theravada tradition there is something called the five hindrances, the five obstacles — anger, attachment, dullness and sleepiness, restlessness, and doubt or hesitation. And as I am sure many people know, these five characters tend to visit us rather frequently. Sometimes they take turns; sometimes they all call together; sometimes they go away after a while; sometimes they stay — it varies. In some deep sense, these five are the five representatives of nonpeace. If we start meeting with them through the practice, especially when we begin the spiritual path, we may realize that there is radical agitation in us and superficial peace. We may also realise that we want the opposite — we want radical peace and superficial agitation. But this takes work. Once we begin to understand the dynamics of all this, however, we are very happy to work in this direction and, honestly, after doing this seriously for some time, we cannot conceive of a better direction for our energies. There is a sense of relief when we start waking up to this fact. A retreat may squeeze out more of the hindrances. It may also help us to see and to understand them better, and to begin to overcome them. The reason for this is rather obvious. A retreat is a simplified situation; it is a carefully devised no-escape situation, and there is nowhere to hide from the hindrances in such circumstances. Maybe in our everyday lives we do avoid the hindrances, but in a retreat we cannot do that. Provided we just follow the schedule, we are going to meet hindrances. There is no way to avoid it. Now, there is something we should remember. If we talk too much about these issues, we may develop what we could call ‘the suspicious meditators syndrome’ — How come a whole hour has gone by with no hindrances? Something must be wrong.’ But this is extreme. There are opposite qualities inside us, and the main reason for working on the hindrances is to make those qualities more available. In other words, if we don’t work on the representatives of nonpeace, there is little hope of accessing peace, because they are the hindrances to peace. That’s why we work on them. But peace is already in us. We may be working especially with the breath in the days of a retreat. 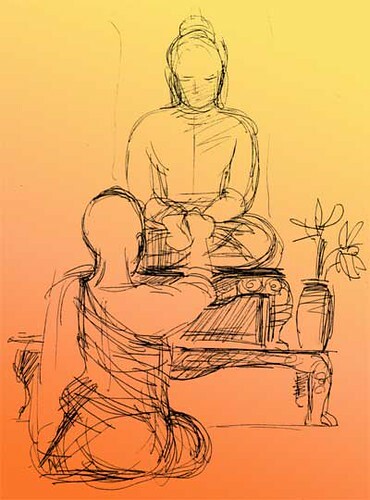 A great teacher in the Theravada tradition was fond of saying, ‘Knowing the breath is knowing the mind.’ If we are working with the breath, if we are being aware of the breath, and a hindrance pops up, that awareness in which we are holding the breath is very likely to touch the hindrance that has just arisen. So, even though we are focusing mainly on the breath, the awareness which is activated becomes available more and more for what is nonbreath, especially if the hindrances are making themselves felt in a very strong way. The first step is recognising a hindrance — just realising it is there, not fooling ourselves in denying the presence of fear or anger or compulsive desire, for example. The first step is recognising a hindrance — just realising it is there, not fooling ourselves in denying the presence of fear or anger or compulsive desire, for example. For some of us, if we have a history of denial in our lives, this recognition may not be so easy. So, first there is the recognition and then, especially if the hindrance is manifesting some of its power, — because the hindrances are powerful — then we can stay a little while with the hindrance, although our main anchor is the breath. In certain instructions for practice in this tradition, it is said — first vitakka and then vicara, which means first you connect with the object and then you hold your attention on that object — connecting and sustaining. We connect with a hindrance, we feel that it is there, it has come upon us, and then, while still working with the breath, there is anger, there is fear, there is attachment in the background; it is not just a fleeting recognition, and then denial again. Step number three is seeing the suffering which is generated by the hindrance — more specifically, I would say, seeing the power of the hindrances. Most manifestations of the hindrances are addictions, and ‘addiction’ means ‘a lot of power’. As a matter of fact, we could say that the first two hindrances — anger and attachment — are at the root of all addictions. This is something to be taken into account in order to deepen our knowledge of the truth. There have been many days, months, and years of relentlessly exercising the hindrances, so that they have gained an incredible momentum. And we are a little pathetic when we get discouraged, ‘Oh, you know, I’ve been dealing with this hindrance for two days on this retreat. I’m discouraged!’ Why? We’ve been building them up for decades, and we get discouraged because we’ve been working with them for two days. That’s pathetic! But we don’t know it, of course. How many times do we wake up in the morning in a bad mood, and then indulge in that bad mood? You know, we water it, passionately, wholeheartedly. That can accumulate a lot of power, an incredible amount of power, toxic power. In terms of practice, this means that the hindrances readily hinder mental calmness, but often they also hinder awareness itself. The hindrances easily take us away from awareness if they are overwhelming — awareness of the breath becomes difficult, and awareness of the hindrance itself becomes difficult. Again, we can feel a particular difficulty here. We want to follow the rules, follow the teachings, but we forget about being mindful of the breath, turn our awareness towards the anger, and just get lost; we get sucked in. The power of the hindrances, insofar as they are addictions, have accumulated all this power. What do we do in such a predicament? We use patience and wisdom, which means, in this case, just letting go of our expectations of continuous and meticulous mindfulness. If we don’t, we’re going to be even more stuck in a very difficult situation. On the other hand, we shouldn’t give up on a general awareness. It may be that we oscillate between wanting to be continuously and meticu­lously aware and just dumping it all when we don’t succeed; maybe finding that course of action more dignified! That is naive. That is immature. We shouldn’t just give up a general awareness of what is happening at any time. We realize that we’re having a hard time being mindful of the breath and being mindful of the attachment, or the anger — okay. But there can be a general awareness of what is happening. Maybe we need to do some more walking meditation; maybe we need to do some movement, whatever. Keeping a general awareness means that we don’t give up the capacity to listen to ourselves. Usually, when we talk about awareness, the most common metaphor is of ‘seeing’ and ‘looking’, but the metaphor of ‘listening’ is also very good. We evoke your name, Avalokiteshvara. We aspire to learn your way of listening, in order to help relieve the suffering in the world. You know how to listen, in order to understand. We evoke your name in order to practise listening with all our attention and open-heartedness. We will sit and listen without any prejudice. We shall sit and listen without judging or reacting. We will sit and listen in order to understand. We will sit and listen so attentively that we will be able to hear what the other person is saying and also what has been left unsaid. We know that just by listening deeply we already alleviate a great deal of pain and suffering in the other person. We are used to thinking that we either listen to someone else, or someone else listens to us, but in the practice of meditation, there is the possibility of listening to ourselves, of listening to what is happening in our own minds. Why shouldn’t we? Being aware means listening to our minds. 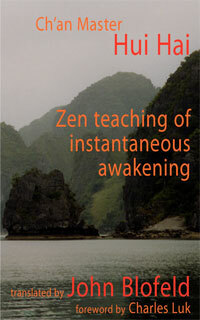 Thich Nhat Hanh underlines in a vigorous way the fruits, the results, of wholehearted listening. Only by listening, itself, do we alleviate suffering. Now, this works in exactly the same way when we listen to ourselves, which is something we do not normally think about. This is a different kind of listening; this is ourselves listening to ourselves. And this gentle awareness, in itself, alleviates our pain, our suffering. This is extremely important. 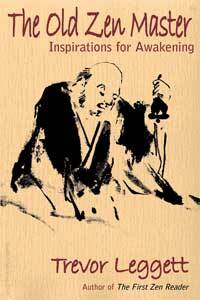 The immediate effect of alleviating our suffering is one of the most important truths of awareness. Maybe we don’t always bear it in mind that we are alleviating suffering when we are in touch with our hindrances, when we are listening, listening . . . Of course, listening, being aware, has nothing to do with identifying. Let’s take the hindrance of doubt, for example. Do we ever listen to our mind doubting in the same way that we listen to a ‘plane or the wind? Usually, we identify with doubt. Perhaps we repress it, or perhaps we allow it to proliferate, but this is completely different from listening to our doubt, or listening to our anger, or listening to our fear, with an open heart, attentively. Do we deserve this kind of listening attentively to what our minds are saying? We may think we don’t deserve it. We are not going to do this for ourselves. But that is ignorance, avijja; it’s a great source of suffering; it’s a strong devaluation of ourselves. Maybe we are ready to listen to someone else’s pain, not out of any narcissism, and not in order to ingratiate ourselves with someone, but out of sincere friendship, because we are genuinely ready to do so. Yet we are not ready to listen to our own pain. When it comes to ourselves, it seems to be different; there is a subtle or not so subtle lack of trust, a subtle or not so subtle self-devaluation. It’s a form of violence, isn’t it? Like belittling ourselves. But if we listen, according to those precious lines by Thay [Thich Nhat Hanh], if we listen to our hindrances, what is it that we hear? We hear the need for help, we hear a request for self-acceptance. It’s as though, behind the anger, or the fear, or whatever, there is this voice saying, ‘Take care of myself.’ We are saying it to ourselves, if we listen attentively, ‘Take care of myself. Protect me. Do not leave me alone.’ It’s as though we know, somehow, that there is both shadow and light within us. And we are addressing ourselves as though saying, ‘Stop this violence against myself. Stop this prejudice, this destructive attitude, against myself.’ And it may be very subtle; it doesn’t have to be blatant. Self-acceptance — now! That is what we’re asking of ourselves. (Not in the future, once we’ve become good meditators, you know, ‘I’m going to accept you on condition . . . I’m going to accept you . . . ,’ talking to ourselves, ‘if . . .’) We set conditions on ourselves all the time, and this is why, if we ask, ‘What is our biggest disappointment in life?’ We would say, ‘Me. I am the biggest disappointment in my life. I am the biggest frustration.’ It’s obvious. We have set so many conditions upon ourselves that we are bound to be the biggest frustration of our lives. It’s as though we are constantly telling ourselves, ‘I will accept you if . . . , if . . . , on condition that . . .’ in a very detailed way, and practice is invaluable in showing us this destructive, divisive, toxic, attitude. Why aren’t we at ease? Why is it so difficult to be in the present moment? Why are we recurrently worried? The main cause is this self-tormenting, this attitude which is very different from holding ourselves, from taking care of ourselves, from protecting ourselves. Making a decision to foster total self-acceptance without delay is not something to be underestimated, and it is important to make a habit of renewing this decision. It’s a bit like taking refuge; it is equally important. Of course, when we take the refuges, it takes practice for them to bear fruit. This is very similar. We make the decision to totally accept ourselves, and then it takes practice for this fundamental decision to bear fruit. I have always found the teaching of the Buddha to be great and profound in many respects, and one aspect which I have found to be particularly deep, and at the same time very clear, is the Buddha’s system of dismantling selfishness and of fostering compassion. I feel that we should never lose sight of the crucial structure of the spiritual life — self-acceptance and lack of self-acceptance, and the preciousness of the practice to show us the power of non-self-acceptance, of the hindrances, as well as of the possibility of overcoming them. But it takes listening, gentle listening, helping ourselves. I have always found the teaching of the Buddha to be great and profound in many respects, and one aspect which I have found to be particularly deep, and at the same time very clear, is the Buddha’s system of dismantling selfishness and of fostering compassion. It is an extremely sophisticated and effective way of going beyond ego, or ‘I-mine’. 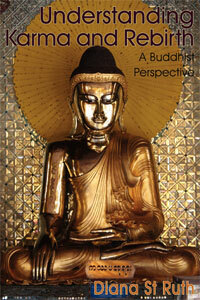 At the same time, Buddha is very clear and outs­poken about how necessary it is to cultivate oneself, to love oneself. 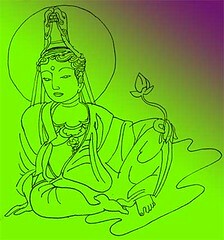 In this respect, there are words which recur often in the Nikayas, the Discourses of the Buddha, which can be translated literally as ‘one who loves himself/herself’. Other words which occur relatively frequently can be translated as ‘one who develops himself or herself through meditation’. If we don’t develop ourselves, we shall not be adequately equipped to go beyond selfishness. There is a lot of wisdom in this attitude. Obviously, we are not talking about indulging ourselves narcissistically; we are talking about becoming stronger in order to overcome great weakness represented by selfishness. It is, therefore, necessary to listen attentively to the hindrances, to see the way they work and the power that they carry, to listen wholeheartedly and attentively to them, so as to be able to catch the cry for help that is enmeshed within them. We are asking help of ourselves — not because we don’t want the help of other people, but because we are our closest neighbour. And this goes two ways. Once we start taking good care of ourselves, then there is no leap needed to reach other people; it comes organically. We’ve taken care of someone in bad shape who was in our closest vicinity — ourselves. This was a very logical thing to do. We’ve developed skills in doing this, and this overflows towards others. We can, of course, begin by helping other people. If we have some maturity, then this is very good, but we all know that we can easily use other people, without even realizing it, in order to give ourselves some relief. You know, we want to be able to say, ‘I’ve done something. So I’m less unworthy.’ There is that danger. But we could just put our efforts into developing self-acceptance, in wholeheartedly help­­ing ourselves, with an attitude which I like to call ‘humble boldness’, an attitude of seeing that this is necessary and just jumping into it. We can make mis­takes, of course, but once we’ve seen how necessary it is — this self-protection, this taking care of ourselves — then we don’t forget it. Narcissism is self-destructive and destructive to others. Taking care of oneself, on the other hand, is exactly the opposite — it is positive for oneself and positive for other people. Barre, Massachusetts, USA, in July 1995. 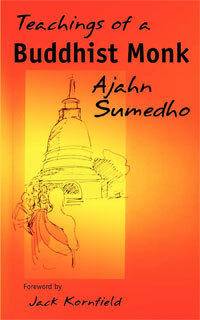 Clear, lucid, practical, and compassionate.